The English, Welsh and Northern Ireland exams bodies have been told that recent mistakes in question papers were "disappointing and unacceptable". None of the papers was set by the CCEA locally. 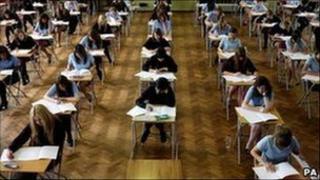 But it is understood a number of pupils in Northern Ireland sat tests run by Edexcel, AQA and OCR. Some questions on biology, business studies and maths were impossible to answer. Ofqual said that will have caused anxiety among students. It has ordered the exam bodies to double check for errors in the papers for exams which have not yet taken place. Exams standards watchdog, Ofqual, has said recent errors in exams set for GCSE and A Level are "disappointing and unacceptable". The group has written to the bodies setting the tests calling for more checks to stop any such errors. Ofqual chief executive, Glenys Stacey said, "We take instances like this very seriously. "I am calling on awarding organisations to take steps now to protect students from further disruption and anxiety." The regulators are asking the awarding organisations to give assurance that additional checks will be implemented as part of their quality processes. Where any further errors are identified, Ofqual said steps must be taken to ensure that students take question papers free from error and fit for purpose.